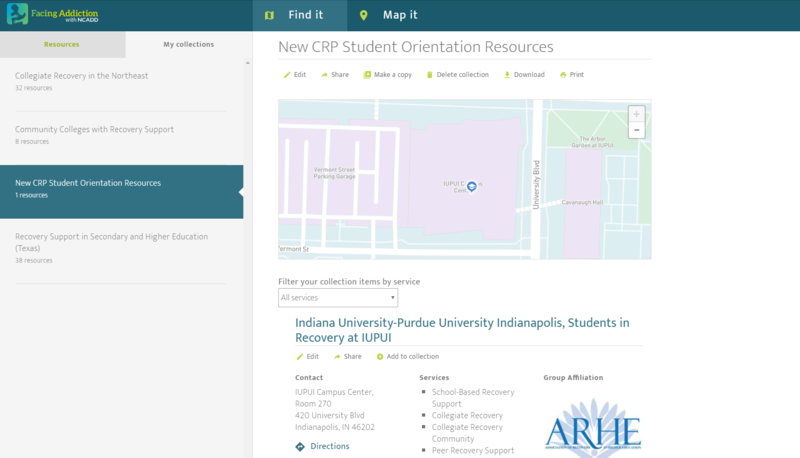 Once efforts get underway and community asset mapping activities have identified local support and care resources for students, careful attention should be given to those places that initially serve and refer students in recovery when seeking support services. This remains a significant area of emphasis throughout any capacity-building effort as organizers work together to better understand these "points of entry" and ensure that internal and external collaborative partners are adequately equipped to welcome, orient, and then transition students to what they need next. What is important here is to leverage this work to remove any barriers to others accessing these entry points and to identify the prevalent characteristics and needs of those seeking care and support. This ultimately allows you to define, create, and share population-specific collections of helpful resources. Over time, creating resource collections and tracking referral pathways can help you reveal any gaps in care where you may need new skills or capabilities. And it allows you to better equip recovery allies with tools—if they know someone who is presenting a specific need or health risk, then you can provide information on the known support pathways at the institution and in the community. Capacitype data and mapping services directly serve the online application from Facing Addiction with NCADD, the Addiction Resource Hub. The collections feature lets you create custom lists of resources that you would like to remember, reference in the future, or share with others. Because collections are specific to your account, you need to Sign in or Create a new account to use the collections feature. Before you begin, it may be helpful to Take the Tour of the application. Any search conducted in the application can be saved to a collection using the Save results to a collection button in the map tools area. You can then choose to add the resources to a collection you have previously created by selecting from presented list. Or you can start a new collection by assigning a name in the box below Create a new collection and selecting Add to collection. To create a collection from a resource page, select any resource of interest from the map (or list view) and then select Add to collection either on the map display or the selected full page. You can choose to add the resource to a collection you have previously created by selecting a previously created collection from presented list. Or you can start a new collection by assigning a name in the box below Create a new collection and selecting Add to collection. To share a collection, you will need to Sign in to your account and then select My collections in the Find it section. Select the collection you would like to share form the menu and press the Share button just below the name of the collection. Your resource collection can then be shared with your student group, a student or colleague, or friends using Facebook, Twitter, or an emailed link to the selected collection of resources. If you receive a link to a collection or there is a link of interest posted on social media, you can Sign in to your account or Create a new account and then select Make a copy. Use the form to personalize the Collection Name and then select Save a copy. We have found that efforts aimed at building capacity for recovery support at institutions of higher education best start from an appreciative frame. There are already things present in our midst – talents, services, resources – that can contribute to and support the efforts you are making to support students in recovery. You just need to locate them, and make them visible and accessible.